Half of children aged 11 and 12 have a social media profile, despite most platforms' minimum age being 13, a study from regulator Ofcom suggests. And it may seem true..
Children's charity the NSPCC called on the government to act on the issue of under-age profiles. The media watchdog also said children were increasingly getting their news from social media, but most were aware of the concept of fake news. Just 32% believed that news accessed on such platforms was reported truthfully. Ofcom's Children and Parents Media Use and Attitudes report found that 46% of 11-year-olds, 51% of 12-year-olds and 28% of 10-year-olds now have a social media profile. Parental awareness of the age limit was low - with about eight in 10 of those parents whose children use Instagram or Snapchat unaware of the restrictions. More than four in 10 said they would allow their child to use social media ahead of them reaching the minimum age required. The NSPCC said: "Social networks are clearly turning a blind eye when it comes to children under 13 signing up for their services. "For too long sites like Facebook, Instagram and Snapchat have failed to protect children on their platforms and government urgently needs to step in." It is recommending that ministers force social networks to design child protections into their services via an amendment to the Data Protection Bill, which is due to be voted on in two week's time. A spokeswoman for Facebook - which also owns Instagram - said that it enforced its pre-teen ban. 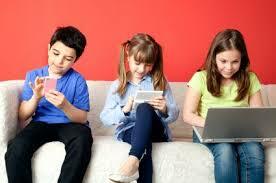 The report suggested that older children - aged 12 to 15 - were relatively sophisticated consumers of news. More than half (54%) said they used social media platforms such as Snapchat, Facebook and Twitter to access online news, making it the second most popular source after television (62%). Nearly three-quarters (73%) were aware of "fake news" and four in 10 said they had seen such a story. Of those aware of fake news, 86% said they would make an effort to fact-check stories. Emily Keaney, head of children's research at Ofcom, said: "It's reassuring that almost all children now say that they have strategies for checking whether a social media news story is true or false. "There may be two reasons behind this: lower trust in news shared through social media, but the digital generation are also becoming savvy online." Snapchat has rapidly grown in popularity among youngsters, Ofcom found, while Facebook is on the wane. In 2014, 69% of 12 to 15-year-olds had a social media profile, and most of these (66%) said their main one was on Facebook. That has now dropped to 40%. And, in more bad news for traditional broadcasters, YouTube has become a more recognised brand among children than the BBC and ITV. Some 90% of 12 to 15-year-olds used YouTube, watching music videos and those showing pranks and challenges.